Last week for the mystery seed of the week I showed a photograph of an acorn. I'm surprised I didn't get any comments from botanical types, because the acorn itself isn't a seed. 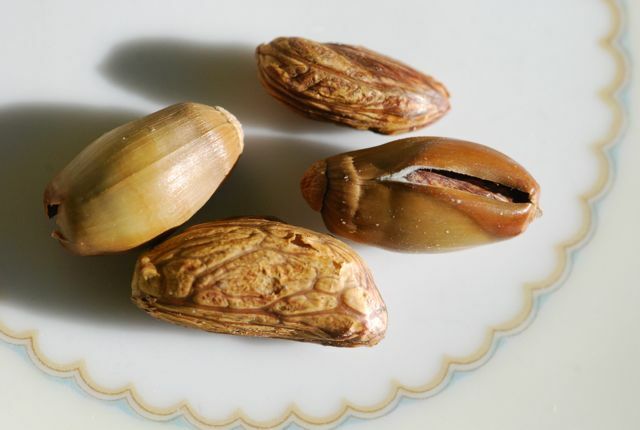 Generally one or two seeds are found inside the acorn casing. 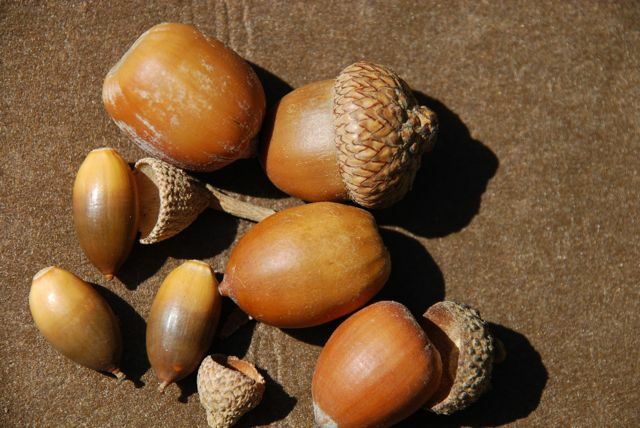 Acorns come in many sizes and shapes, depending on what kind of oak tree they come from. There are over 200 species of oaks found in North America, but the species I'm going to show you today comes from the Mediterranean region. 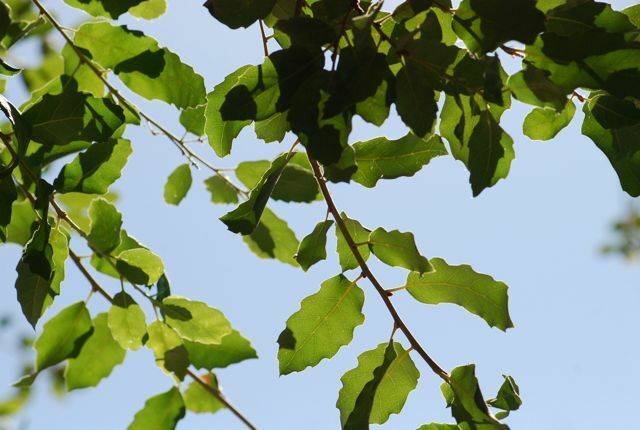 It is the cork oak, Quercus suber. When my son and I read that cork oaks can grow in Arizona, I immediately called a botanically-minded friend. Yes, she knew where we could see one growing. We hopped in the car. The first thing you notice about this glorious tree is its unusual bark. 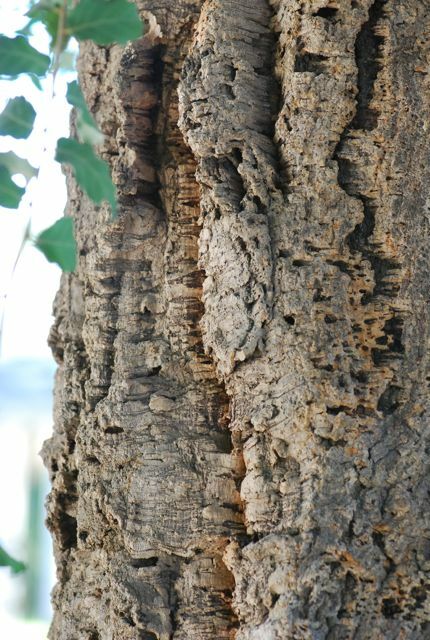 The cork bark is used for bulletin boards, flooring, gaskets, and wine corks. As long as it is removed carefully, without touching the cambium underneath, harvesting cork does not harm the tree. This tree had a rich history. It was planted during WWII when cork was in high demand, but the supplies were largely cut off. The tree has a lovely, open growth form with gracefully draping branches. I'm afraid my photos were not able to capture its elegant beauty. Each acorn contains a wrinkly, veined seed. Aren't seeds marvelous? Have you ever seen a cork oak? When I see cork oaks, I always think of the book about Ferdinand the Bull with its delightful, whimsical illustrations of the corks on the trees. No , I don't think I have come across this type of oak. Next time I visit Kew Gardens I will look closer. Thank you for a very interesting post. Cork oaks seem to pop up in unusual places. Good luck finding one. 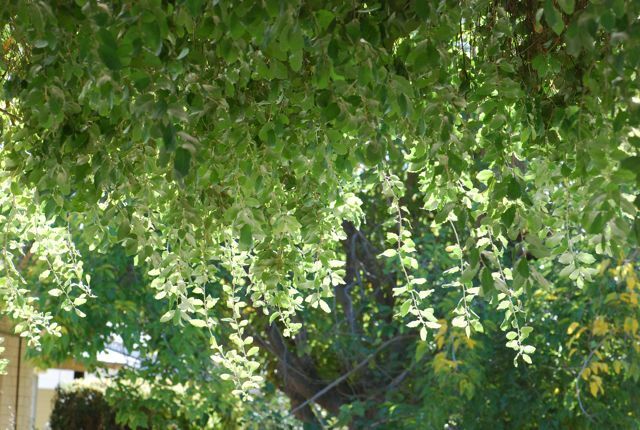 There is a cork oak at the LDS Temple in Mesa, Arizona (east lawn in site of the reflecting pool). I go occasionally hoping to find a few cork oak acorns. Thanks for letting us know. We also found one on the ASU campus. I live in Tucson Arizona. They have the cork acorn trees at Casino DEL SOL. I have gathered the seeds and am in the process of germinating them now. Hope they start growing. I will have to look for those next time I'm down there. Good luck with your germination project. Let us know how it turns out. I’m looking for cork oak acorns. If you have them I like to buy few from you. I'm afraid we don't have any. If I find some, I'll let you know.